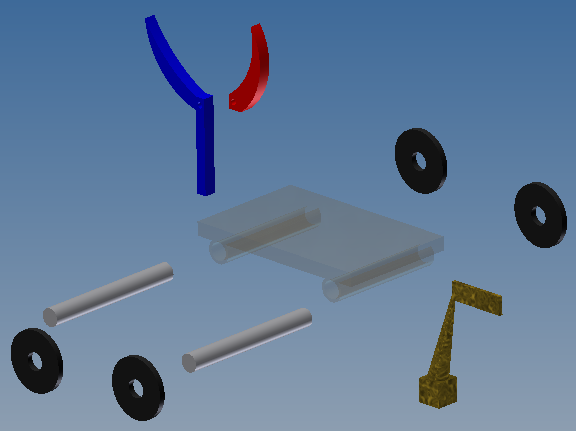 This week, we will review how to use individual parts to create an assembly. The process itself is not very difficult, but if it is not done properly, it can cause quite a headache. Since we will later use the animation option within Inventor itself, it is especially important that students are comfortable with assemblies. Assembly – basic constraint used to constrain objects to proper orientation with respect to one another by using surfaces, edges, planes, points and axes. Use “Drawing Annotation Panel” to add balloons and parts list – line up balloons! 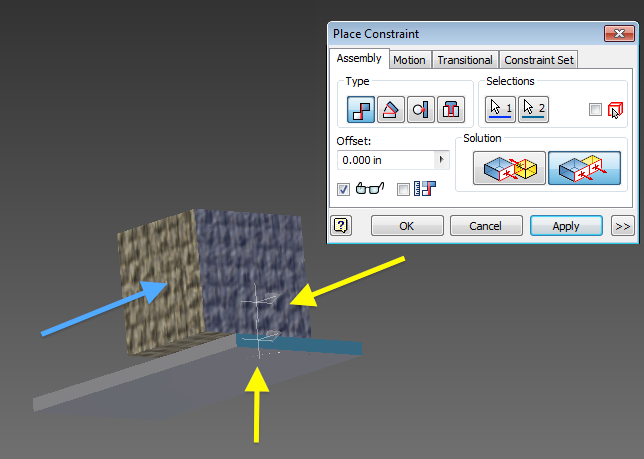 When doing constraints, you often need to consider each dimension that is a factor, i.e./ you will often need 3 constraints to cover your x-y-z axis. 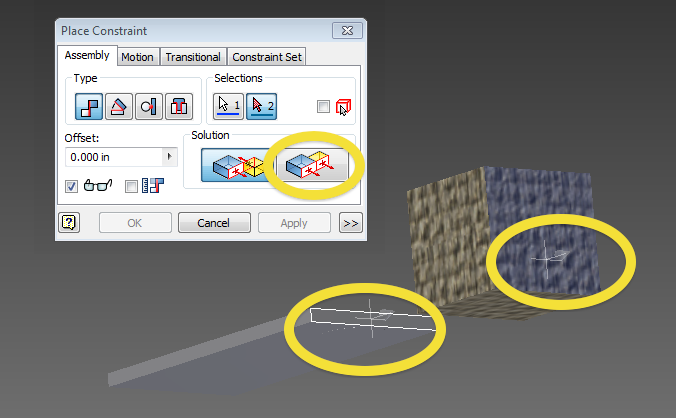 Start by opening up the constraint window in Inventor. Notice the Part constraint window appears. On it are the constraint types, the directionality of the constraints, and the value of deviation of that constraint type. a. So we start with our parts. As you can see, there is a rod and a hole. Lets put the rod in the hole. i. To start, lets select our constraint window. Then we will select our constraint type (MATE as always). ii. Now lets select the geometry of the part were going to mate. Because we want to mate the axis or center of this cylinder with the axis of the box, move the curser over the part until the dashed line appears. iii. Next, lets select the hole where we are putting the part. 2. As before, move the curser to the inside of the hole until the dashed line appears. Press enter to confirm the constraint. b. So the rod is constrained inside the rod but as you can see it still slides in and out, so lets put on the next constraint. Controlling the depth of the rod in the hole. 1. The more robust option is to use the top surfaces of the rod and the hole or parallel flat plain (i.e. the box top). Also note that you can alter the directions of the selected faces, as well as control the separation between the two plains. 2. The limited option is to mate the edge of the rod with the edge of the hole. Again this can create problems if the holes are of unequal size. 2. Putting the flat part on the other flat part. a. So as mentioned before, a fully constrained object is bound in 3 dimensions. So lets start by constraining the cube to the board of the plank. i. 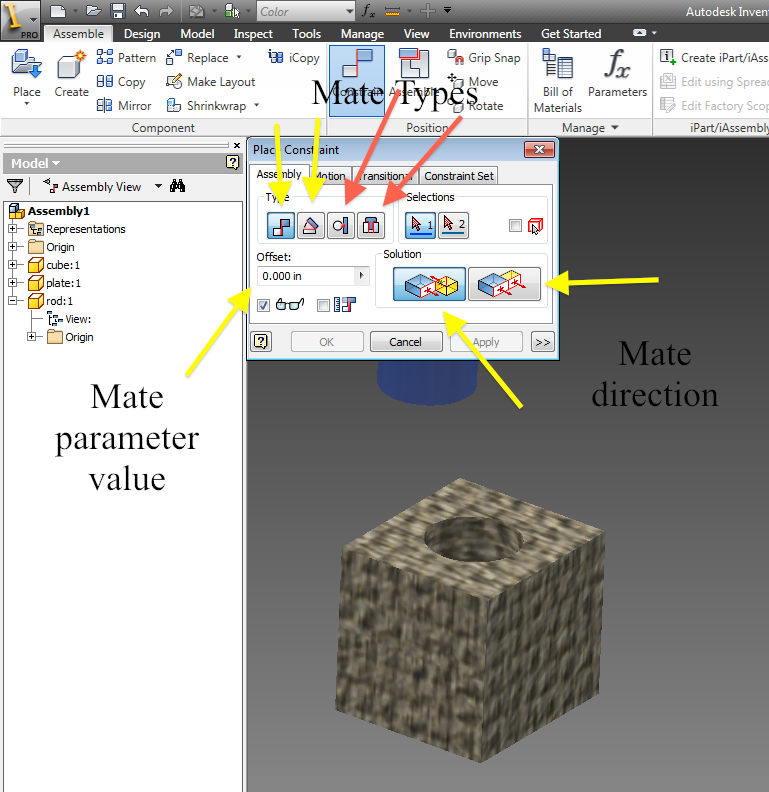 As before, lets open the constraint window and select mate. ii. Often, you will need to pan or rotate your view to see the surface of interest. Lets turn the part to select the bottom of the cube. iii. Rotating the view, we can see the top of the board we wish to constrain to. By having a 0 offset, the cube will now be bound to the top surface of the board. Moving like a computer mouse on a desk, the cube can still move forward/back and side to side, but it can no longer move up off the board (Z-axis). b. Next, lets put the second bound on the cube so that is cannot move in the Y-axis. i. 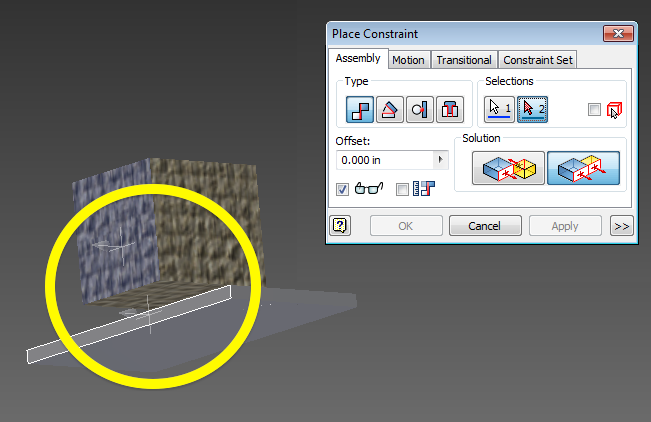 As before, enter the constraint window, select constraint and select the surfaces of interest. ii. This time, note that the directionality has been undated. This becomes important with more complex geometries. c. With the constraint approved, you can see that the block is constrained in 2 of 3 directions and can only move in the x direction. Applying the final constraint fully bonds the object. i. Repeating the same process as before. a. Quite often, you will have one part rotating in relation to another. Weather it is a gear or an axle, having constraints easy to manipulate will ensure that when it comes time to animate things are easy to work. i. First, the point of rotation should be defined. Because the cube will be rotating about that central axis, lets prepare the part. 1. Observe that the origin of the part is not along the point of rotation. Moving the sketch to move the origins location on the surface. 2. Repeating this on all directions, we can control the position of the origin. As you can see, the origin is now set along the axis of rotation, as well as it is set to the top of the cube for easy access. ii. Now note that there is no axis or rod set on the flat board. Because we want the block to rotate, an easy way to do this is to artificially put a cylinder for rotation. 1. Extruding the region creates an axis that we can rotate about. To keep things looking nice, the extrusion can be on such small scale that it is nearly invisible, 0.01in. I have highlighted the regions so that you may observe them. lock the cube face to the board face. ii. For the final step, we will use the angle constraint. Much like the mate constraint we select the faces of interest and set some displacement value. However, unlike mate where the displacement is a distance, here the displacement is an angle. This will be very helpful when it comes to animation as we can comment the angle to change, this rotating the part.